Wildcats defensive end Ryan Mueller finished the season sixth nationally with 11 sacks and was seventh with 18.5 tackles for loss. TEMPE, Ariz. — Kansas State followed up last year’s BCS bowl run with a thud, opening the season with a loss to FCS school North Dakota State at home. It didn’t get much better after that, with three more losses over the next five games, leaving the Wildcats not only out of the BCS bowl picture but in danger of missing the postseason altogether. Kicking its offense into another, high-scoring gear, Kansas State (7-5) reeled off five wins in its final six games to earn a spot in the Buffalo Wild Wings Bowl against Michigan on Saturday night. "They learned a little bit about how to practice, how to prepare," Kansas State coach Bill Snyder said. "It’s something that they probably took for granted at the outside of the season. I think they finally said, `Hey, let’s do it the right way.’"
The Wolverines opened with five straight victories, including a win over Notre Dame in their second game. Other than a 29-6 loss to Michigan State, the Wolverines were in every game but just couldn’t finish things off. "No question, this football team is 11 points away from being 11-1," Michigan coach Brady Hoke said. "We haven’t finished games and executed the way we needed to at the end of the games." MICHIGAN’S QB: The Wolverines were hit with a huge blow when quarterback Devin Gardner hurt his toe in their regular-season finale against Ohio State. Gardner, who’s thrown for over 4,000 yards and 32 touchdowns the past two seasons, aggravated the injury last week and is out for the bowl game, leaving Michigan in the hands of freshman Shane Morris. He attempted nine passes in three games this season and played just four games as a high school senior because of mononucleosis. K-STATE’S TWO QBs: Instead of trying to replace Heisman Trophy finalist Collin Klein with one quarterback, Snyder has gone with a two-headed approach. Junior Jake Waters is the thrower, accounting for 2,198 yards and 15 touchdowns passing. Sophomore Daniel Sams is the runner, rushing for 784 yards and 11 TDs. Snyder doesn’t typically like to use two quarterbacks, but he believes Waters and Sams together give the Wildcats the best chance to win. STOPPING MUELLER: With a freshman starting his first game at quarterback, Michigan will want to keep Kansas State from knocking Morris around and possibly rattling him early. 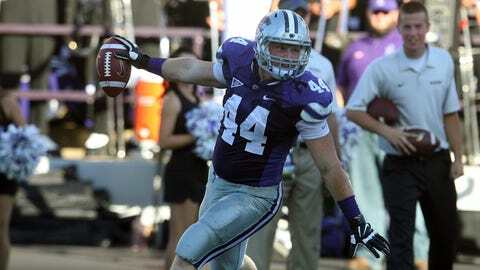 Doing that will start with slowing down Wildcats defensive end Ryan Mueller. The 6-foot-2, 245-pound junior was a walk-on in 2010 who developed into one of the nation’s most disruptive defensive linemen. Mueller finished the season sixth nationally with 11 sacks and was seventh with 18.5 tackles for loss. BOWL WOES: Snyder orchestrated one of college football’s biggest turnarounds his first stint in the Little Apple and got the Wildcats back on track when he came out of retirement in 2009. One thing he hasn’t been able to do, at least recently, is win bowl games. Kansas State enters the Buffalo Wild Wings Bowl on a five-game postseason losing streak that includes a 35-17 loss to Oregon in the Fiesta Bowl a year ago in the desert. The Wildcats haven’t won a bowl game since scoring in the final 90 seconds to beat Arizona State in the 2002 Holiday Bowl. GO-TO GALLON: Fifth-year senior Jeremy Gallon has become Michigan’s go-to receiver. After catching 49 passes last season, Gallon had 80 receptions this year, which is 33 more than anyone else on the team. He has 1,284 yards receiving and nine touchdowns and accounted for the Wolverines’ four longest plays from scrimmage, including an 84-yard catch from Gardner against Ohio State.